When life seems to lose its meaning it's easy to be wrapped up in our own personal problems to the extent that we are oblivious to the suffering of others. Many of us turn a blind eye to those in their times of need instead of offering outstretched arms to comfort and console. Taking time to work on your self-development and feeling compassion for others can work wonders for the soul. Not only will your clients feel better inside, it will help to foster positive feelings towards them from others who are often endeared to these appealing qualities. 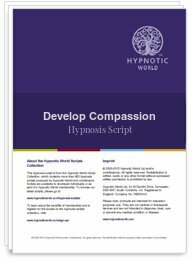 This Develop Compassion hypnosis session can help your clients to change their area of focus and lend a helping hand to others less fortunate.